Lakshmi Murthy is currently registered for a doctoral program at IIT, Bombay. 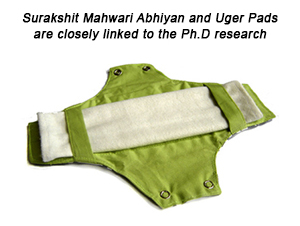 Her area of research surrounds menstrual management. Her work is deeply rooted in the belief that all girls and women have a right to be healthy and clean at all times and specially during mentruation. Project Title: Menstruation, Management, Sustainability - At what cost? Expulsions, secretions, discharges or flows - the human body is in a constant state of expelling what it does not require - feces, urine, sweat, spit, dandruff or hair. The process of expelling is rejuvenating, renewing and gives the body "new life" with each expulsion. As the expelled product exits the body, it is replaced by newer products of the same nature. This cycle continues and only stops at death. The "commercialization of human expulsions" can be seen in many areas. Deodorants and antiÐperspirants to manage sweat, shampoos to "condition" hair, perfumes and sprays to mask odour, the cosmetic industry recognized a profit area and has hugely benefitted. Menstruation too has made its firm presence in the commercial arena. Multinational companies have developed and aggressively marketed many products to manage menstruation. Sanitary Napkins, tampons and other management product have given girls and women freedom, but has this come with a cost? What are these costs? Are these products burdening and cluttering our surroundings? Are these products actually "healthy"? Are these products improving women's hygiene as claimed? This research will examine all this and more.